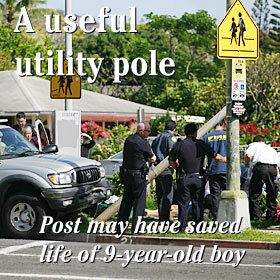 A light post in front of Kahala Elementary School might have saved the life of a 9-year-old boy just before 1 p.m. yesterday. The 74-year-old driver of a pickup truck apparently blacked out and hit the light post, which then hit the boy, said Bryan Cheplic, spokesman for the city Emergency Services Department. The pole took the brunt of the impact, probably saving the boy's life, Cheplic said. The boy was taken to the Queen's Medical Center, where he was treated and released, Cheplic said. The driver also was taken to Queen's.